Well, I predicted G-protein coupled receptors (GPCRs) and Brian Kobilka, but not Robert Lefkowitz. Congrats to both! GPCRs are cell-surface receptors that translate signal from an extracellular ligand to a G-protein, a molecular “switch” turned on and off by GTP. (The discovery of the G-protein was awarded the 1994 Nobel in Medicine). 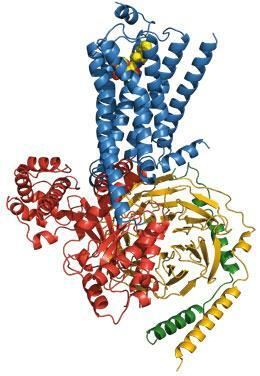 GPCRs are very important in a variety of signaling in the human body, and most modern drugs target GPCRs. Kobilka and Lefkowitz first had inklings of the structure of GPCRs in the 80s, when they began isolating and purifying the β2-adrenergic receptor (βAR). They eventually realized that the protein had seven transmembrane helices; to their surprise, that hinted at a very similar structure to rhodopsin—the component in the eye responsible for detecting light—another GPCR. This discovery implied that all the receptors that couple to G-proteins might have a conserved structure! Over the last few decades, Kobilka, Lefkowitz, and others have produced a bunch of structures for GPCRs, which should aid in future drug design. I think it’s fascinating is that Kobilka was a postdoc with Lefkowitz many years ago. I wonder how often it happens that both the professor and a student/postdoc share a Nobel? Of course, Kobilka has performed enough work during his independent career to earn a Nobel, but I still think it’s cool that he won the award with his former professor. I’m not sure why Stevens or Palczewski were not also included in the prize, but it seems that the committee (given only three available slots, of course) stuck to the early discoveries that lead to the GPCR structures. The line between chemistry and other fields (especially biology) is often blurred, and that’s a wonderful thing; but this fact sometimes results in a chemistry Nobel Prize being awarded for a decidedly biological discovery (like the 2009 prize for the structure of the ribosome). This may be exacerbated by the fact that the physiology or medicine prize tends to go to things directly related to health, and the chemistry prize often is used to cover the more basic biological science feats. Personally, I think it is a testament to the central position the field of chemistry holds in the Venn diagram of science. Biology is the next frontier for the physical sciences! There is so much to learn about how biomolecule, cells, and organisms work. Let’s embrace biology’s commingling with chemistry with all our hearts! I remember bringing this point up when Roger Kornberg was awarded the Nobel in 2006, as his background is undeniably “chemical” in nature, at least in my book. More generally, I think to where my former labmates have ended up (I did my Ph.D. in chemistry in a typical “Arts & Sciences” chemistry department) – some are now faculty in chemistry departments, others in med school biochem departments, and a few others here and there (engineering, pharmacology). Most of them are doing work that naturally grows out of their graduate/postdoctoral time in my former lab. As you mention, a background in (physical) chemistry is broadly applicable to a wide range of research, and – as I’ve been finding more and more over all these years – those areas can stimulate interesting distinctly chemical questions. “I wonder how often it happens that both the professor and a student/postdoc share a Nobel?”// I’m not sure of the frequency of this sort of thing happening but certainly more recently, Richard Axel shared the Nobel with a former postdoc, Linda Buck. Better yet, what about shared Nobels between parent/child? I think this has happened multiple times, but my favorite has always been the Braggs (I am restraining myself from making a pun right now).